Bushnell 781818 Spacemaster 15-45x60 Spotting Scope 781818 FREE SHIPPING! The Bushnell Spacemaster 15-45x60 is a full-size spotting scope designed for long-range observation and target tracking. Its fully multi-coated optics feature multiple layers of anti-reflective coating, increasing light transmission to produce a clear, bright and detailed image even at extreme range. It comes with a Rainguard hydrophobic coating on the external lens surfaces that breaks up water droplets, delivering continued visibility in wet conditions. The scope body itself is also waterproof, and features protective rubber armor for shock resistance. The scope has its own tripod for stable hands-free observation. Its backpack-style carry case makes it highly portable. 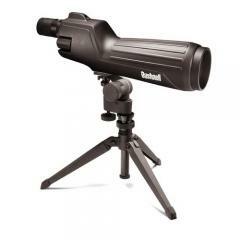 ©2002-2019 CopsPlus.com: Bushnell 781818 Spacemaster 15-45x60 Spotting Scope 781818 FREE SHIPPING!